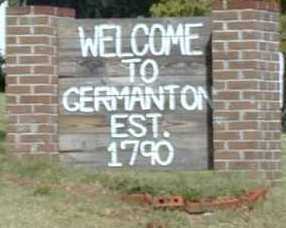 Germanton is a community in south Stokes and north Forsyth Counties. It was incorporated in 1790, but it's charter was repealed in 1895. It was the county seat of Stokes County from creation until 1849 when it was divided to form Forsyth County. It is at an altitude of 662 feet. In 1943, it was visited daily except Sunday by train 60, on its eastbound journey to Greensboro, and train 61 heading west about 10:45 AM. This photo of the station was taken in 1916 (date of valuation) or 1931 (# on photo itself) as part of the ICC Valuation. 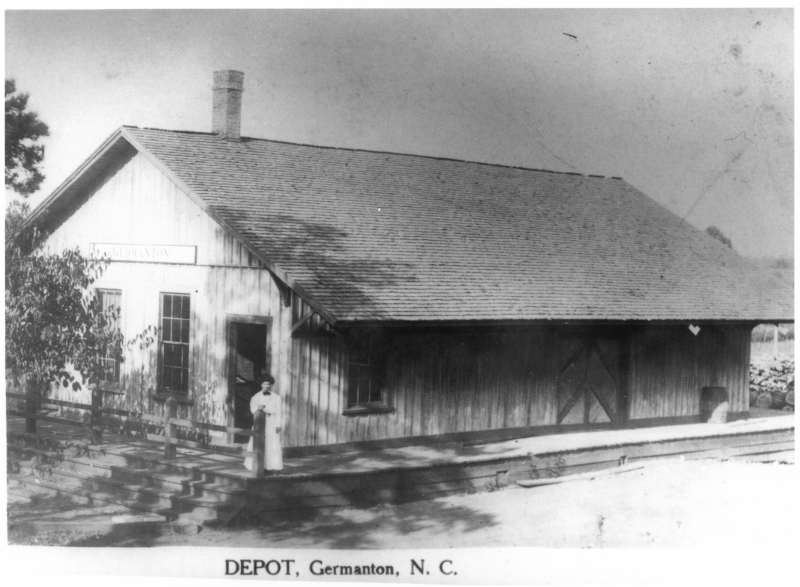 The Germanton station was a combination freight/passenger depot of "type 3" according to the ICC. It was 29 years old at the time of the valuation meaning it was likely built in 1887. It was identical in all respects to the station at Pinnacle. The footprint was 50'x30' with the bay 9' wide and 12'-6" from the end along the longest side facing the tracks. The gable roof (13'-3" at ends and 21'-6" at peak) was covered in shingles. A wood platform extended 3' from the station on all sides and was 5' off the ground. A coal bin was located under the platform.The lamp seen in the photo is a "Dietz 'Pioneer' station oil lamp on a 6"x6" post 8' tall. 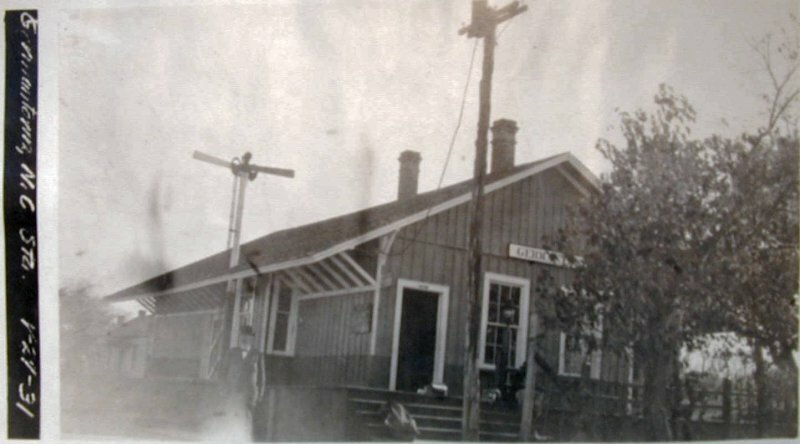 Here's another photo of the station from the other side taken about 1910. Click on it for an 800x600 image. The station was surrounded by a 6" deep layer of chert on top of a cinder fill. Plank crossings were also used for passengers. A woven wire fence 54" high and 30' long was located on the side away from the tracks. 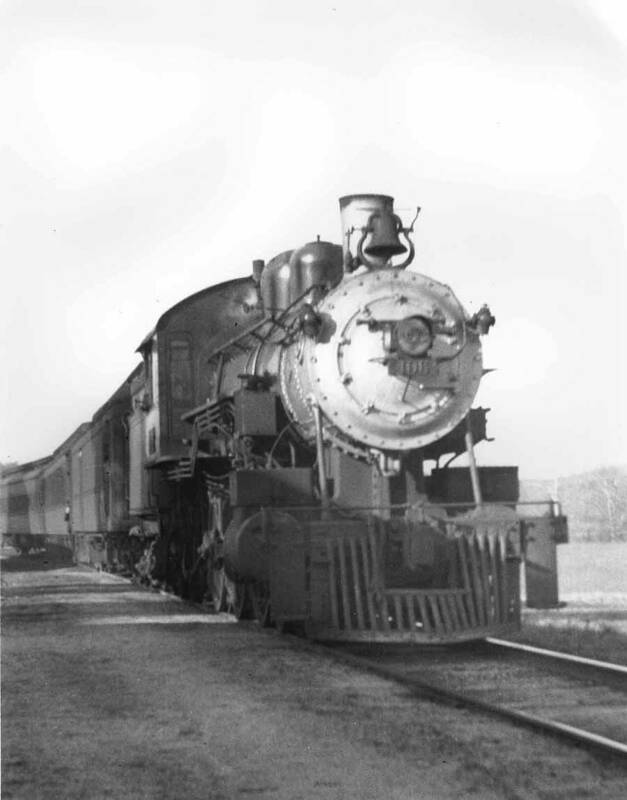 The A&Y tracks arrived from the northeast in Stokes county, crossed Buffalo creek just before entering the town, and exit south west in Forsyth county.. The crossing of Buffalo Creek is just north of where the Buffalo joins Town Fork Creek east of Germanton. The village is located west, across the creek from the depot. According to the ICC valuation, improved farm land was to the north and south. Some of this land was rather fertile bottom land. Around the depot was a "mill" but the ICC notes do not identify it further. A standard station 'oil house' constructed in 1905 was also located on the grounds (see map for location). 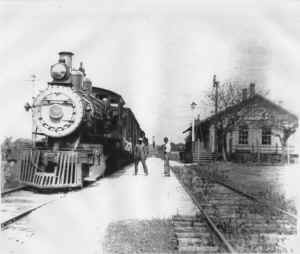 On the same side of the tracks, a warehouse and a laborer's house were located a short ways along the siding toward the Buffalo Creek crossing and section house was located on the opposite end of the siding. Across the tracks, on the side of the station away from Buffalo Creek crossing, was a 10' x 12' by 9' tool house (type #13). The section house and other laborer dwelling were identical to the houses located at Dalton (types #11 & #12). The tool shed was also identical to the one at Dalton. Two outhouses served the dwellings. A 3' diameter, brick lined well provided water to the dwellings and presumably the station. 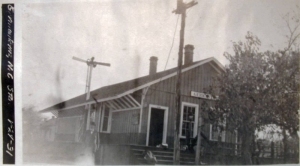 A 6' x 8' gable-roofed barn was also located on the property in the vicinity of the station. The meet for Trains 60 and 61 was planned where there were passing tracks! Luckily, the A&Y didn't run long trains on most days: the spurs and other tracks could hold only 20 cars. Today the A&Y tracks are abandoned and the town is served by the new Norfolk Southern on the old Norfolk & Western tracks. A Southern Railway Shippers Guide from 1916 indicates no industries were located in Germanton using the A&Y for delivering and receiving products by rail. I will add industries as I receive information about them, but my guess is that Germanton was well served by the N&W and industries did not need to ship via the A&Y. Since I have few photos of this town, I'm including a shot of A&Y 106 pulling a passenger train through Germanton given me by Rick Cromer from the Beck collection. This photo came from a collection of Mr. Beck via Rick Cromer. It shows an A&Y train headed by #58 and stopped at the station. Note the plank bridge being used between the car and the station platform to transfer freight. I was told this photo was taken circa 1939, but I have no solid evidence for that time frame. The station does not appear to have the early two tone paint scheme. 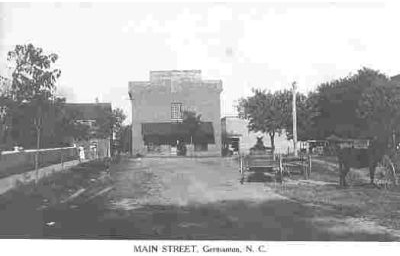 This real photo postcard depicts main street Germanton circa 1909. At least here's evidence that it was not a "one horse" town.